Golden Globe nominee Kate Hudson (Almost Famous, Reluctant Fundamentalist) and Oscar Nominee James Franco (127 Hours, Milk) play a young American couple, Anna and Tom Wright who have left America behind following the wake of the 2008 financial crisis and have decided to build a new life in London. With a renovation work in progress involving fixing up an old house in Mortlake, West London, their dreams seem to be coming true until they run into more debt. Luckily or unluckily their basement tenant dies of a drug overdose leaving a bag of cash in the ceiling. The moral dilemma involving a sudden discovery of treasure ensues when Good People turn bad. As Tom Wright says money is not necessarily bad, people are. Directed by Danish born Henrik Ruben Genz, Good People is a gritty entirely grim and nerve wracking domestic thriller involving the Wrights, a washed up cop Detective John Haden played by Oscar nominee Tom Wilkinson (Michael Clayton, The Best Exotic Marigold Hotel) and a really nasty drug dealer Jack Witkowski who is out to avenge the death of his brother, played by Sam Spruell (Snow White and the Huntsman, The Hurt Locker) who is in turn chased by a French drug dealer who models himself on Genghis Khan, played by Omar Sy who was so brilliant in the 2011 French film The Intouchables. This is a deglamourized thriller with director Genz painting the British capital in an exceedingly grim and dull light. 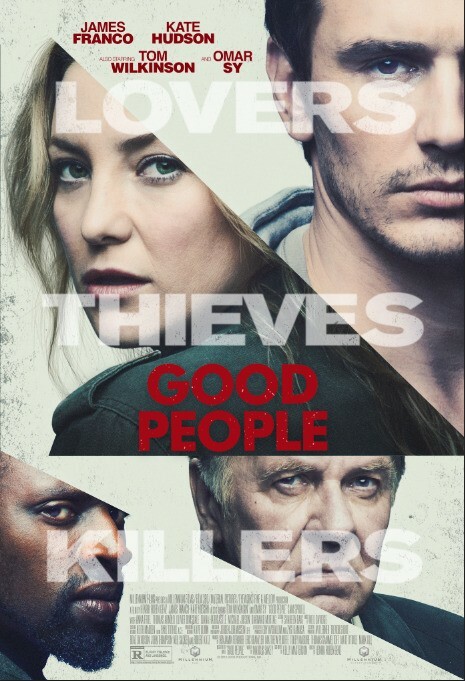 To be frank, never has Kate Hudson looked so washed up in a film as she does in Good People. Normally Kudson is a vivacious blonde actress known for starring in such perky and colourful American romantic comedies as How to Lose a Guy in Ten Days, Fool’s Gold and Bride Wars. With a script by Kelly Masterson and based upon a novel by Markus Sakey, Good People is a gripping if slightly depressing violent thriller saved by good performances by Wilkinson and Franco as the morally dubious husband Tom. Anna Friel (Limitless) and Wilkinson’s real life wife Diana Hardcastle (The Best Exotic Marigold Hotel) also star. Viewers need not catch Good People on the big screen as seeing it on DVD or TV would be more preferable due to the film’s lack of imaginative scenery and utterly dreary production design.